The fire in Zircon, called dispersion, is caused by light entering the gemstone and separating into a prism of rainbow colors. Zircon has even more fire than diamond and its fiery brilliance is displayed in a painter's palette of colors. 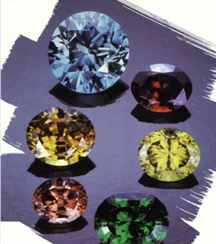 Most gemstones, including diamond, need enhancement through cutting or treatment to look as they do in a piece of jewelry. Since antiquity, some Zircons, primarily the blues, colorless and golds, have been enhanced through heat treatment to permanently intensify their brilliant hues. Though suitable for everyday wear, remove your Zircon before engaging in any activities that may cause sharp blows or scratch Zircon's surface. While today we are not limited by tradition, the symbolism of Zircon is treasured as a gift for December birthdays.